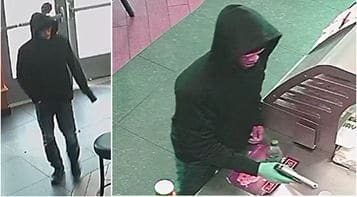 D.C. police have surveillance video of a man wearing a black, hooded sweatshirt who showed a gun to a restaurant employee just before 10 a.m.
WASHINGTON — He brought a gun into the Subway sandwich shop at 4800 Nannie Helen Burroughs Ave. in Northeast D.C., but left without a foot-long, or a dime. D.C. police have surveillance video of a man wearing a black, hooded sweatshirt who showed a gun to a restaurant employee just before 10 a.m. on Monday morning. A news release said he asked for money, but did not get any, and then he left. If found, the man will be charged with assault with intent to rob while armed with a gun. Police want anyone with information about the incident to call them at 202-727-9099. Police offer a reward of $10,000 to anyone who provides information leading to the arrest and conviction of anyone responsible for an armed robbery in D.C.